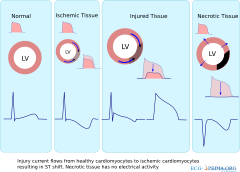 ST changes occur when the action potential in the ischemic area changes, resulting in an electric injury current from the healthy cardiomyocytes towards the ischemic area during the repolarization fase. The ST segment represents ventricular repolarization. 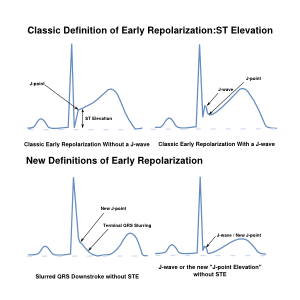 Repolarization follows upon contraction and depolarization. During repolarization the cardiomyocytes elongate and prepare for the next heartbeat. This process takes much more time than the depolarization. 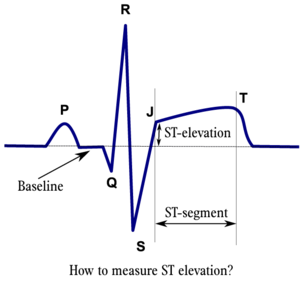 The elongation that takes place during repolarization is not passive; it is an active process during which energy is consumed. 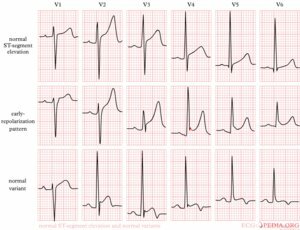 On the ECG, the repolarization phase starts at the junction, or j point, and continues until the T wave. The ST segment is normally at or near the baseline. Minor STT changes are not necessarily associated with cardiac ischemia. 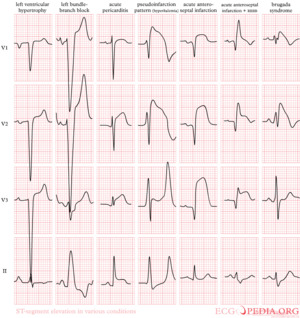 The T wave is usually concordant with the QRS complex. 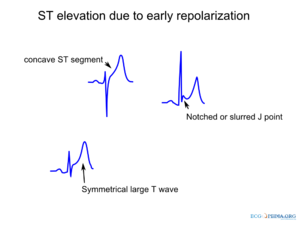 Thus if the QRS complex is positive in a certain lead (the area under the curve above the baseline is greater than the area under the curve below the baseline) than the T wave usually is positive too in that lead. Accordingly the T wave is normally upright or positive in leads I, II, AVL, AVF and V3-V6. The T wave is negative in V1 and AVR. The T wave flips around V2, but there is likely some genetic influence in this as in Blacks the T wave usually flips around V3. 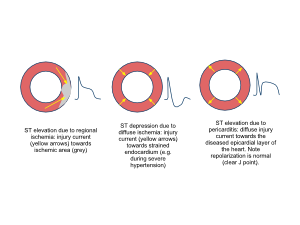 The T wave angle is the result of small differences in the duration of the repolarization between the endocardial and epicardial layers of the left ventricle. The endocardial myocytes need a little more time to repolarize (about 22 msec). 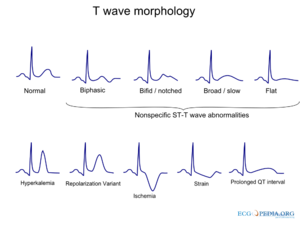 This difference causes an electrical current from the endocardium to the epicardium, which reads as a positive signal on the ECG. ST elevatie is measured at the junctional or j-point. Unfortunately the term early repolarization is used to describe different phenomenons with differing clinical impact. Image adapted from Froelicher et al. In a study by Otto et al., among 123 patients with chest pain and ST segment elevation of >1mm, 63 patients did not have a myocardial infarction. Diagnoses in patients who did not have a myocardial infarction were LVH (33%) and LBBB (21%). In daily practice this means that in these patients the diagnosis of myocardial infarction has to depend on other diagnostic means, such as laboratory tests, echocardiography and coronary angiography. An important clue for the diagnosis of ischemia is the presence of reciprocal ST segment depression. Reciprocal ST segment depression. If one lead shows ST segment elevation then usually the lead 'on the other side' shows ST segment depression. (This is usually seen in ischemia as well. Negative T waves in III, AVR and V1 as in this example are normal. 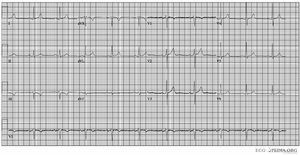 An upright T wave in III is more common. Acute neurologic events, such as a subarachnoid bleed. This page was last edited on 17 February 2013, at 10:56.